Home → Hot Topics → Can I Repair or Modify My Propane System Myself? In an era of do-it-yourself videos online and big box home improvement stores that sell just about anything you need for home repairs, many homeowners feel that nothing is off limits in a quest to save money on repairs. However, repairing or making changes to a propane system isn’t as simple as you might assume. Homeowner A builds an addition onto his home, and needs to add this addition onto his propane heating system. Homeowner B wants to convert his natural gas range to one that uses propane. Homeowner C decides to convert his wood-burning fireplace to gas logs. Homeowner D builds a detached garage on his property and needs to relocate his propane tank. Homeowner E discovers that his tank is leaking. Which of these homeowners needs to contact his propane company for assistance? If you answered “all of the above” you would be correct. Each of the above scenarios are common ones, and it’s just as equally common for some homeowners to attempt to save money by doing part of all of the work themselves. An experienced do-it-yourselfer might feel comfortable with running piping for plumbing or wiring a new room, but even those with years of experience in repair and maintenance should defer to the professionals in the propane business when it comes to LP gas modifications and repairs. Regulators – A propane system is a pressurized system, and as such requires a regulator in order to deliver gas at the proper pressure for your home. Any addition or change to your system must take into consideration the regulator, since it maintains the correct (safe) pressure for gas entering the structure. Carbon Monoxide – Improper burning of propane in appliances produces carbon monoxide. As you probably are aware, carbon monoxide can be deadly. Maintaining the proper ratio of fuel, ignition, and air is crucial to the proper use of propane, and any modifications to appliances by someone other than a professional can result in this ratio being off. 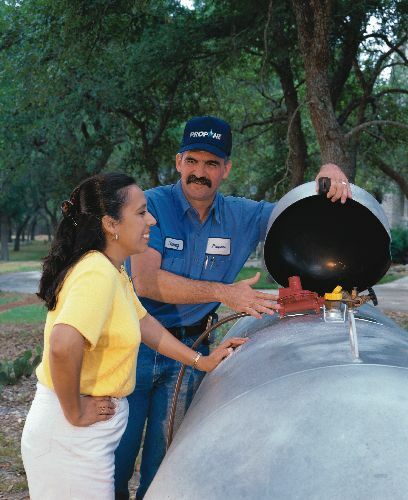 Moving a Tank – Relocating a propane tank is tricky at best. Using a forklift or other heavy equipment to move a propane tank isn’t advisable, because the liquid propane inside the tank can shift, causing damage to the lifting lugs. Because a propane tank is cylindrical, there is also the possibility of the tank rolling over, breaking off valves and fittings and allowing propane to vent into the surrounding area. Tank Repairs – Repairs to a propane tank that is damaged can render that tank unusable. Welding on a propane tank should only be done by a tank manufacturer or by a tank fabrication and repair company. If a tank is damaged beyond repair, by law it must be replaced. Legal Issues – There are a host of laws regulating the maintenance of propane tanks, and with good reason. Working with propane requires a thorough understanding of its properties and the equipment used to deliver gas in a variety of applications. To maintain the safety of all involved, by law all repairs and modifications to a propane system must be made by a licensed individual or by a propane supplier. If a tank or system is altered in any way by a homeowner, propane suppliers can refuse to fill or service them. The answer to “Can I repair or modify my gas system myself?” is a resounding NO. Your propane system is a highly specialized structure, and any alterations made to it should be done by a licensed propane supplier. This protects you, your family, and your home. It may be tempting to try and save a few dollars by doing it yourself, but in the long run it could cost you much more than you ever dreamed possible.